I have an online business idea since in today's challenging economy there are so many stores going out of business. Actually, it has been a dream of mine for quite a long time. I just wonder if I have the skills to build an online business that would sell custom cakes. I'm a baker. I design and make all sorts of custom cakes as a side business from my home for local events. I'd like to turn my passion into a business, however since there are so many stores going out of business these past several years I have been leery of getting my own bakery shop. Creating and decorating custom cakes is what I love to do. Turning my cake making side business into a viable online business idea has been in the back of my mind as an alternative to a store front. Testing out how to build a web page is actually quite inspiring since it seems so easy. I'm just typing! Then I added a graphic from my computer. Building a website to promote my cake business may be the opportunity I have been looking for in order to start building my baking skills into my own full-time job. It seems like it isn't too difficult and as I continue to think out loud, it sure would give my business credibility if people can find me online. I could include a portfolio of all the different types of cakes I make. Kind of like a photo gallery! Okay, now my head is spinning and I am getting really excited. The next step is figuring out how to actually get started. . .
P.S. Thanks for helping me think all this out and for getting my thinking turned into a totally different but potentially wonderful direction! Turning my online business idea into reality!! Follow your dream and Just Do it! You can write about your different baking tips, recipes, and teach us how to decorate cakes and cupcakes! I'm dying to learn, personally, and keep visiting my local JoAnne's website, but haven't yet registered for classes! 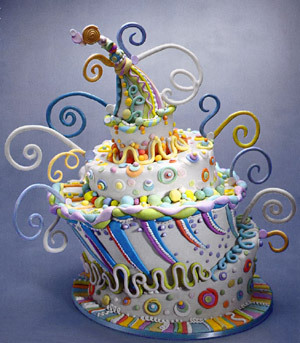 Use photos galore, excite women to make new decorative cakes!! This can bring in local business, those who find you online.., but also make an online income from those who simply visit your website.